How are you building those lifetime relationships that lead to monthly giving, major gifts, and legacy gifts? How do your supporters know that their gift is making an impact? How are you regularly inspiring and delighting your donors? In my work with thousands of nonprofits over the past ten years, I’ve found that, aside from lacking crucial systems, the leading cause of lack of growth in individual giving is the absence of a consistent donor communications program. That’s why, in Simple Development Systems, I recommend a bare minimum of 12 donor “touches” a year, and as many as 24. Yes, 24! But what what about our budget? Our board would kill us if we spend money on a fancy mailing. We don’t have the time or money to be sending out 10 newsletters a year and doing six direct mail appeals! Does anything say “you matter” quite like a handwritten note? The handwritten, especially in the age of the internet, is inherently personal. Plus, email communications are often fast and fleeting. It’s easy for our brains to forget the text and images we see online. I’m not telling you to nix email, especially since email is vital to your overall communications. But I am suggesting you mix it up, and an unexpected handwritten note has the potential to inspire and delight your donors. You’re giving them something to remember you by. I loved this thank you I received from Simple Development Systems’ member, OneJustice. One of the best and easiest ways to improve your donor acknowledgement program is through the simple process of rewriting your thank you letter. In this before and after example from renowned international copywriter and donor retention expert Lisa Sargent, you’ll see how some simple tweaks result in a letter that sings. Imagine yourself on the receiving end of Lisa’s letter! That’s how you want your donor to feel. If you send your donor a letter that makes them feel good, they won’t forget it. And they won’t forget you. Think about your internal processes for new donors. Could you follow up your thank you letter with a new donor welcome package that follows two to three weeks later — one that might contains a new ask or an invitation to join your organization’s monthly giving program? See how some of our students have embraced Welcome Kits and check out this past blog post, which includes links for a few winning examples to inspire you! How are you recognizing your donors individually and letting them know you see them? As a donor, it can often feel like you get lost in the shuffle. Trust me, I’ve been there. Sometimes, organizations I’ve made gifts to seem to forget that I’m a person named Pamela. They forget that there’s no one-size-fits-all approach for donor communications. But we know that donor bases are filled with lively, dynamic humans with their own personal quirks, ticks, and reasons for giving. Speaking to them directly is the best way. Internet and email *can* be fleeting, but with the right touches, they don’t have to be. Email can be a great medium for your donor communications if you work it the right way. Think about creating separate Google alerts using the names of some of your most qualified donors. If your donor comes up in the press (they just wrote a new book, won an award, sold a business), you can dash off a quick email. When you see an article you know a particular donor would appreciate, send them an email and link, letting them know that you thought of them. This email impact report from Brittany’s Hope, a Simple Development Systems’ member, really resonated with me. Brittany’s Hope seeks to empower families and communities through transforming the lives of orphaned and at-risk youth. They specialize in international special needs adoption grants and humanitarian initiatives. As you can see, an impact report is a great way for Brittany’s Hope to showcase their successes. I’ve found myself bemoaning the lack of compelling fundraising communications from colleges and universities time and time again, so when I find a solid example from an institution, it’s a beautiful thing. Check out this 4-page Impact Report from The College of Dentistry at The University of Saskatchewan. This piece managed to net $10,000 in donations — without an ask! Impact reports can be a compelling and cost-effective donor communication tool. You don’t need to spend a lot of money to show your supporters how your nonprofit, through their help, created positive change in the world. Plus, it’s a great way to use concrete numbers and statistics. By themselves, numbers and stats are dry, and not exactly capable of inspiring human emotion, let alone giving. But within the context of an impact report, numbers can become much more compelling. Want to bring lapsed donors back into the fold and encourage them to rethink their relationship with you? Of course you do. Check out this inspiring appeal letter example sent by Heidi Zulauf-Mulderink. She received this piece from Countryside School, an independent elementary school located in Champaign, Illinois. Notice how the appeal letter tells a captivating story that guides the reader through a school journey. The narrative here evokes nostalgia, which isn’t easy to do, and David’s voice comes through loud and clear. Even though the journey is his, it’s easy for the reader to relate to his story. The concept of an “adventure” is undeniably impactful and authentic to who Countryside School is, as well as their community of students. On the response device, the donation amounts and uses for the gifts are specific, providing supporters reassurance that their donations will go toward making great things happen at Countryside. As Heidi says, one donor even gave the full $5,000 to “fund the rest of the adventure for next year!” Wow. A gratitude report on a postcard? You might not think of this as an option for communicating gratitude to your donors, but N Street has proved it’s possible. Check out how they made it happen. Sure, using a postcard for a message means dealing with limited space, but that doesn’t mean you can’t make the best of it. The message begins with gratitude, opening with, “Thanks to your generosity…” Village Possible/#VillagePossible is a clever way of summing up both the nonprofit’s recent successes and the impact of their donors. I like the specific gift amount options, as well as knowing where that money will go. This went out during the holiday season, a time when donors, myself included, are more inclined to give. But knowing that any donation that I make (up to $10,000) will be doubled takes it to the next level, creating a sense of urgency to give right now. I’ve been a strong advocate for donor surveying and its hidden superpowers for years. Surveying has the potential to reveal valuable insights about those who give to your organization. Think about how you can survey your supporters on a regular basis. The more you get to know them, the better you can tailor your communications and develop the kind of deeply personal relationships that are built to last. But I’ve witnessed this time and time again: most organizations turn a simple survey into something way too long and complicated. Asking your supporter to spend ten minutes reflecting on their answers in an online survey is…well, about eight or nine minutes too long. Surveys shouldn’t be tedious chores. Make yours quick, easy, and fun. Case in point: this terrific example I received from Zingerman’s, purveyors of culinary deliciousness. Even with one simple question that involves ranking the customer experience, this “counts” as a survey. It shows that Zingerman’s cares about their customers and hopes they’ll be back. And what does a business have in their repeat customers? A relationship that’s built to last. When it comes to your surveys, stop overthinking and over-complicating. Stick to KISS (Keep It Simple Stupid). It won’t steer you wrong. Why do your donors give? When I ask most fundraisers this question, their response is usually a litany of details about their organization’s various programs. I’ll hear about the marvelous work they’re doing in the community, how unique they are, and that there’s no other organization doing what they’re doing. Well, here’s an outline of a simple letter I sent out in my first job, almost two decades ago (wow!). I remember how I sent out this introductory letter to 20 loyal donors who had given over $250 a year during the past five years, along with a brief survey and stamped, self-addressed envelope. Eighteen responded. Several sent in checks, even though I hadn’t asked for money. Three eventually became major donors. This is a guideline for you to imprint your own creative flair. Modify it to your heart’s content and tailor it to your needs. Make it work for your donors and your organization. It’ll be true to you, and it’ll be true to your donors, too. Time and time again, we’ve tried to hammer home the importance of consistency in communications, especially when it comes to email. Remember, a special occasions aren’t necessary. You don’t need a recent monumental achievement to celebrate, nor must it be a holiday or “special time” of the year for your organization. With fun and frequent communications, you can even condition your supporters to look forward to your emails. The fact is, regular communication is absolutely crucial, so capitalizing on email will serve you well. Send out great email content, and make a plan to send it out regularly, whether it’s daily, weekly, or monthly. I’ve been getting Mike Dooley’s daily emails for so long, I feel as though he’s become a friend of mine. Mike wears many hats, including that of New York Times bestselling author, speaker, teacher, and entrepreneur. His “thoughts become things” philosophy is true to who he is, what he does, and the communications he sends out. I look forward to Mike’s daily inspirational content and good vibes. Check out this example…one of many! You know that storytelling is vital to your donor communications. Collecting stories is a process that never ends. You should always be on the lookout for compelling narratives that you can weave into your communication pieces and share with your donors. What’s a simple way that you can add to your organization’s story bank? What about including opportunities in your emails? You can go the route NARAL did and add a link for supporters to share their stories. NARAL is an organization that has been helping women maintain autonomy over their bodies since the late 60s. But NARAL’s very existence is controversial, so it is crucial for them to convey the humanity behind their work and impact. In this gripping email example, OBGYN Dr. Cheryl Axelrod shares her personal story. It’s a powerful narrative for all sorts of reasons, including the fact that it’s in her own words. Within Dr. Cheryl’s story is a call for solidarity. She encourages women to step forward to share their stories, and there is a link to do so. It’s not only a call to action, it’s a call to be brave. And it’s followed by a message from NARAL’s Digital Director, Kate Thomas, which again encourages women to share their personal accounts and provides a link for them to do so. Have these examples inspired you? 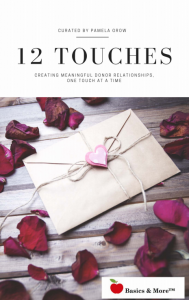 Discover more in the 12 Touches Donor Communications guide. I’m constantly inspired by the content I receive, and I showcase some of the most memorable pieces that I find here, within the space of this blog. If you’re stuck, feel free to use the search tool to look for specific communication examples. Something may catch your eye and inspire you. I, too, suffer from writer’s block from time to time. It’s a pain, but there’s always a way out. Searching for (and finding!) great content out there usually helps me break down the barrier. The bottom line is this: if you make it a habit to reach out to your donors, communicating with them frequently, and communicating with them well, before you know it, it will become second nature for your nonprofit. You’ll enjoy doing it, your supporters will enjoy hearing from you, and your fundraising results will show it. It’s a win-win! Hi Krista, You can find that within the 12 Touches guide (click on the graphic to download it).